Marcel Proust turns away. His head is facing straight to one side but is not quite distant either. It could be considered a picture in profile if not for the angle of his body, crumpled and unusually creating the illusion of multiple positions. He is an aleph of himself. His hand holds his lapel, the reaction of solid determination to not let the memories break upon him perhaps. I am on my third book of Proust’s In Search Of Lost Time or Remembrance Of Things Past depending on the translation (À la recherché du temps perdu) and already I feel compelled to write and discuss its ideas, its moods and its memories. Though resisting for a brief time, coming across a particular portrait of the writer made my resistance crumble. For here in one photo is so much of the books that I have read so far, over a 1000 pages in fact, seeming to me to be shot through the prism of this one, very particular image. Within it, I feel as if what is seen behind the eyes, scribbled down when lying in bed, is captured too; perhaps like a permanent zoetrope of lost loves, social calamities and faith in artistic endeavours. So far, Proust has been sent back into his memories. As soon as this action takes place – that temporal sway backwards and forwards (between mistakes and hindsight) – I imagined the writer looking up from his paper and away in some sense. I could not place what it was specifically he was turning away from, but there was a sense that looking back meant something was put aside; as if one door opened only on the condition of closing another. It wasn’t a sense of the present that was closed off, for with the present provided the hindsight afforded which makes the novel so far astounding and life changing. So much is said about wisdom, as if wisdom has some tangible currency, but it genuinely is the best way to describe what is on the page. 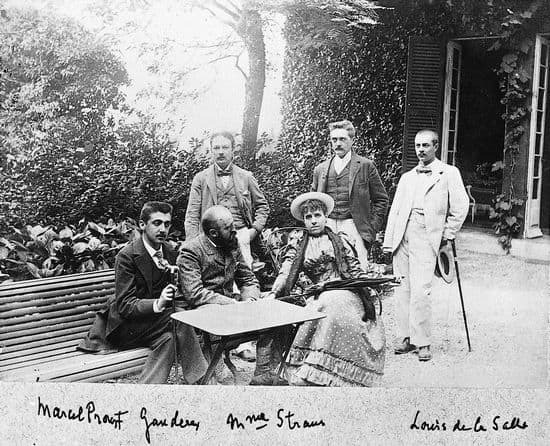 Proust not only accepts his past errors – so far, his placement of faith in high society that simply bores him with its ineffectuality – but positively dives into them and scours them for detail. He must be totally certain that his search for any sort of meaning for existence does not lie there before giving up and moving on. 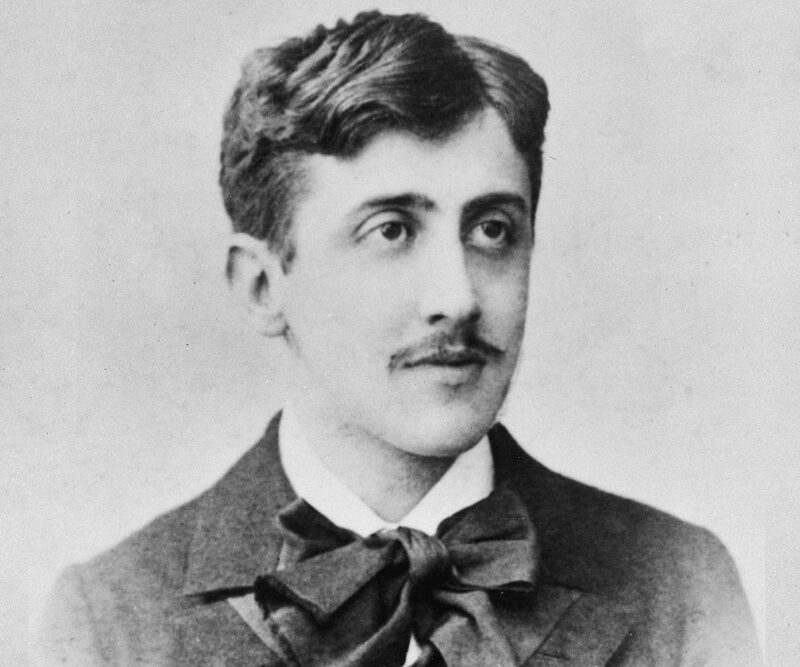 Which direction is Proust really looking in then? For these philosophers, it is all encompassing, neither backwards nor forwards, simply a wider, fuller breadth of perception. Proust can only turn in circles rather than look back and away. But the photo shows him leaning away, not quite fully, but not facing us either. It is ambiguous as to its intentions. There are other photos of course, plenty in fact of the young man smiling towards camera, posing with family, enjoying a view here and there. But I return to this photo, its decorated chair, its elegance and simplicity, and wonder what the man can see; whether, in fact, his vision is a temporal 360 degree curve that renders his angle inconsequential. We, the viewer and the reader, could see it in some sense as looking away as we are really peering over his shoulder in his writing, but memories may have mirrored walls curving down to the ground. All may be potentially perceived. Perhaps then, it is ultimately me, the reader, that Proust is turning away from. It is not a negative aspect or done so in haste, but he is instead enmeshed in the problems of his own wider perception of which the reader is only a small fragment of. “Do not regard me,” he is saying, “look to that and to this and beyond to all.” This may seem ironic considering the writer’s desire to somehow help his readers, fulfilling the role that his father, the medical man, ordained and was never quite satisfied with. Proust is opening up our direction of interest and that is enough as this lone action opens up everything. At first we feel to be looking back with him over his shoulders, a sleight of hand distraction for what seems a back-and-forth wander through the memories of one man. But the real memory, the all encompassing one so far achieved in what I have read, is in the act of writing itself; in the bed, surrounded by scrolls of text in which everything can and will pass by. For that is memory, whether looked at in the eye or ever so slightly turned away from. The zoetrope continues to spin, in either direction. Thanks for that, Adam. Enjoy the rest of The Search.